Translabel has been designed to assist pharmacists in providing accurate translations of common label directions for patients where English is not their primary language. It is estimated that up to 10% of the UK population are in this category. We know that inaccurate use of medicines lead to morbidity and hospital admission so we feel that it is very important to get the correct information to a patient in a way that it is best understood. Translabel has been available as a free to use application since 2006, but usage has been limited by pharmacists requirement for validation and accuracy. Our previous method was to have a second check for a translation provided by a pharmacist (or pharmaceutical society) and then request validation from another pharmacist who is a natural speaker of the language. We had feedback from a number of pharmacists who liked the concept of Translabel but did not trust the methodology. In response we have invested in the application and have fully refreshed the site, the label format and have provided certified validations for each language set. We have also expanded the number of languages significantly to cover UK community languages plus common visitor languages (provided in time for the 2012 Olympics / Paralympics). The labels are now in pdf format which means that by selecting the pharmacy label printer the Translabel can be printed directly from the internet. We hope that the refreshed site encourages pharmacists to use this application to support their communities and improve the communication to visitors to the UK. Click on the dropdown menu and select from the languages. 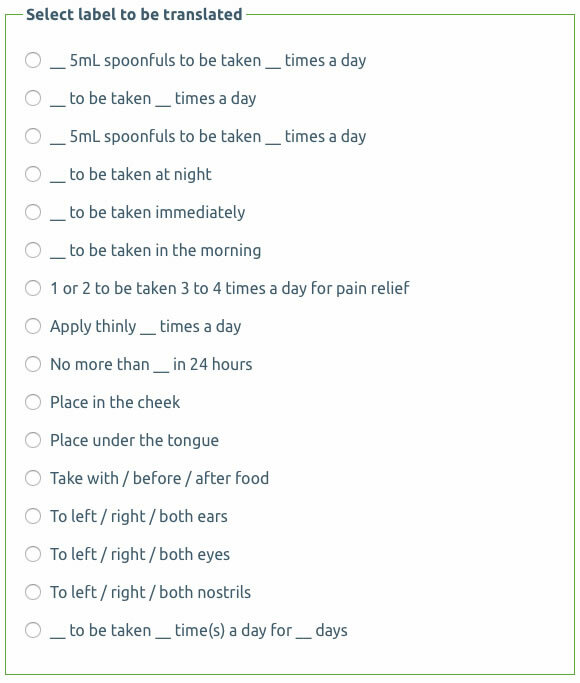 This list also includes English for patients with visual impairment. Select from the list the required text for translation by clicking the radio button on the left of the menu. Click on the ‘Translate’ button to generate the label (this will appear to the right of the screen). Reset cancels the request. 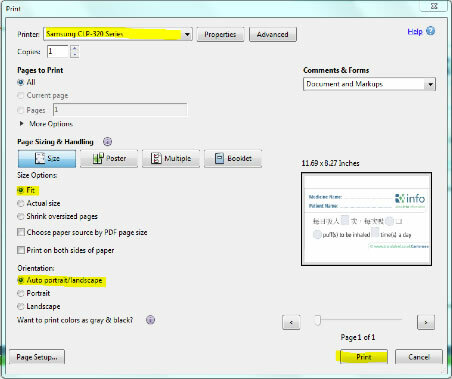 Click the print label button, this will open the label in a new window, then follow your browser's printing instructions to bring up a print dialogue (see below). The label printer should be selected from the list of available printers and the size set to fit. When the Print button is clicked the pdf is sent to the printer. The label can then be completed by adding the patient name and medicine name and any numbers to the matching spaces (in some languages the text direction or context is different so the shapes or hashed underlining allow for selection of the correct details). N.B. Visual Impairment: If a patient with a foreign language requirement also has visual impairment then another printer that can print to A4 should be selected. The pdf image should be set to fit (as below) and can be printed to A4 size. In response to feedback from pharmacists expressing concern as to the validity of the translations we have now made the certified document of translation available. This can be seen by clicking on the link beneath the label. This opens a pdf document with the signed accreditation.